Amphibious assault near Quang Tri, Vietnam. ARVN (Army of the Republic of Vietnam) troops wading ashore, white sand, landing craft, big explosions nearby (from covering air strikes). Huge blast of black smoke off shore (one of their ships must have been hit). Burning off shore, as more landing craft are between fire and beach. Soldiers and helmet in foreground. 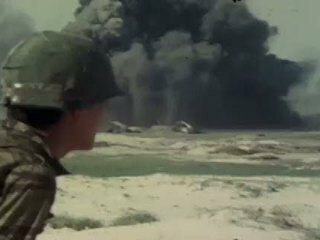 Chicago: “American Experience; Nixon; Quang Tri amphibious assault, 1972,” 05/06/1972, WGBH Media Library & Archives, accessed April 25, 2019, http://openvault.wgbh.org/catalog/V_EA7A3CD850B34BE69FD346F5CA0E2D29. MLA: “American Experience; Nixon; Quang Tri amphibious assault, 1972.” 05/06/1972. WGBH Media Library & Archives. Web. April 25, 2019. <http://openvault.wgbh.org/catalog/V_EA7A3CD850B34BE69FD346F5CA0E2D29>.